What would King think of today’s America? If he were alive, Dr. Martin Luther King, Jr. would be wholly disgusted with the American experiment. Nothing, but everything, has changed — including how we talk about the Black struggle in America. Revisionist historians, including conservative and shameless Blacks, have reframed the struggle against racism to point the blame at the victims. “Cultural deficiencies” are the problem they preach. Jason Riley, one such apologist for White Supremacy, has used King’s holiday to put forward ideas that would cause King, himself, to roll over in his grave. According to Riley, King’s message that “Blacks have an important role to play in their own advancement,” was not his primary one. In his YouTube videos, Riley erroneously claims that the victory against discrimination and for equality has been won. That would mean, however, closing his eyes to the reality of today’s U.S. What he is really saying is that his belly is full, ironically partly due to his ability to blame Black folks rather than White Supremacy primarily for their problems. Riley also says that racial disparities aren’t driven by racism. As silly as that statement is, rather than acknowledging it is at least a part of the problem, Riley instead pulls out a Moynihanian culturally-deprived narrative. This rather smooth misinterpretation says that King focused on the problem of individual White bigotry rather than the institutional racism and discrimination. That is patently false — King took on the system of White Supremacy and its companion capitalism. While King, indeed, preached Black self-help and self-love, he also talked about Blacks being beautiful and encouraged Black self-esteem. His primary work was centered around changing the system that necessitated inequality and changing the values that kept that system intact. If King were alive today, he would be gravely disappointed, but he wouldn’t be surprised. Trump as president would not even surprise him, as he would probably say that the U.S. has the kind of leadership it deserves. As an apostle of hope, King would be bitterly disappointed in the lack of real progress economically, socially and politically. If he were alive, he would insist that those migrants from Central America be allowed refuge. He would insist that humanity trump borders. King, as an internationalist, identified with and supported immigrants who like everyone else are just trying to make it. Those statements are historically untrue. There has been much Black and Brown cooperation dating back to the days of slavery when our Mexican brothers and sisters harbored runaway slaves. The traditional Latin community stemming from Mexico has a lot in common with the Black community — especially considering that much of Mexico is of mixed African, Indian and European heritage. King would be disappointed in the lack of young fighters against injustice as more and more Black youth forgo social justice concerns as they pursue wealth, capitalist status and careers. Instead, they create nonprofits or organizations that go around begging folks in authority to do the right thing. King would take issue with the entertainment and sports industries which have given rise to more Black sportscasters and commentators. He would be disappointed by Stephen A. Smith and the Jason Whitlock and others who use the platform to denigrate and blame Black folks rather than aid in the struggle against White Supremacy. He would be disappointed because he would know the kind of sacrifices that were made to give Black folks these platforms. He would, however, applaud the efforts of Colin Kaepernick and LeBron James and correctly point out to James that the NBA, too, is a bit of plantation. Why else would it prohibit players from staying seated or taking a knee during the playing of the National Anthem? King would also be pleased with the progress that women and LGBTQ community have made. He would be disappointed that it has not progressed far enough. He would be disappointed by the lack of real progress among Black folks as evidenced by Chicago and the broader Black community’s refusal to reign in serial predator and woman abuser R Kelly. He would be heartbroken to know that Black girls and women were allowed to be molested, abused and exploited for decades without any community intervention. He would be shocked at the insensitive victim-blaming and the lack of concern for the welfare of Black women. He would also be appalled that Black Americans had organized no real prison movement to demand the immediate release of non-violent offenders and children who have been immorally incarcerated and treated as adults. King would be saddened by the absolute refusal of this country to create a universal single-payer health care system which would provide health care to all Americans. He would also be disheartened by the current drug epidemic for which the current president refuses to call a national emergency. He would be appalled, but not surprised, by the continued use of police violence as a means of making sure that Black folks, especially, know their place in this society. If he were alive, he would call out the U.S. government’s never-ending war in Iraq, Afghanistan and he would condemn the U.S. attempts to murder those who oppose it with continuing drone strikes that have killed thousands in the Muslim world. He would condemn the U.S.’ constant meddling in the affairs of other countries as it is currently doing in Syria and Venezuela. He would be disappointed in the lack of advocacy for peace and the rather small anti-war movement. 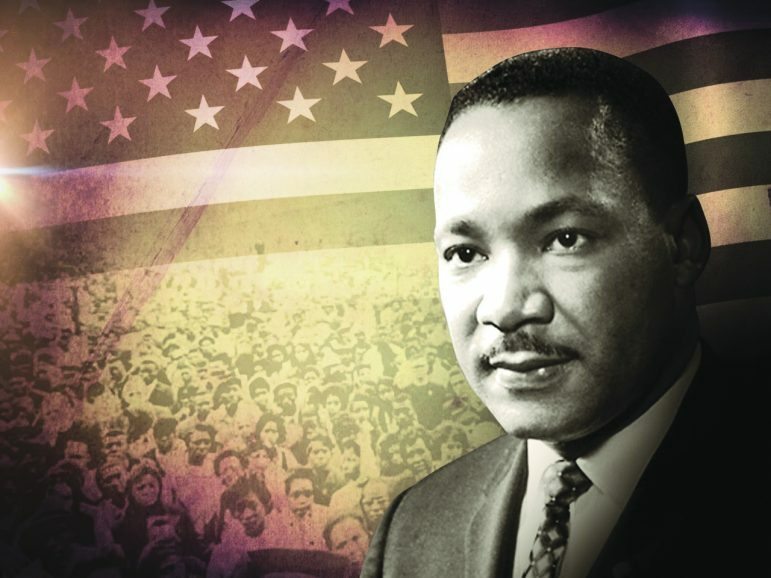 King was a real drum major for justice, equality, and opportunity. He would be critical of a government and society that has, at best, stood still and at worst, is heading backward. The question is what do we do now? I enjoyed reading your article Mel Reeves,and this statement ,” as he would probably say that the U.S. has the kind of leadership it deserves”, this is a DEEP. statement.